If you’re a keen baker who can’t help but have a taste (or three) of your sweet creation before popping it in the oven, you’re in luck. The craze of cookie-dough cafes is becoming ever more popular, for those who reach for the spoon rather than the oven gloves, 100% safe-to-eat cookie dough is becoming increasingly available in the UK and US, online and in-stores. My Cookie Dough, founded in the UK in 2014, now has three stores around the country; the first in St Davids, Cardiff, followed by one opening in Birmingham Bullring and another in Trinity Leeds. The company have also teamed up with food delivery service Deliveroo in these cities to provide convenience in fulfilling all of your cookie dough cravings from the comfort of your home. The menu offers a wide range of cookie dough flavours, from the classic original milk chocolate to something more adventurous like white chocolate and raspberry or peanut butter and chocolate. All of the signature flavours are served with a scoop or two of ice cream; it’s a cookie-lover’s dream. And reasonably priced at £3.95 per serving, it’s a win-win. My Cookie Dough also offers Dough Shakes in a range of flavours, as well as bite-size smaller servings for children. TripAdvisor reviewers describe My Cookie Dough as ‘Genius’ and ‘Cookie Dough Heaven’. The company also received a Highly Commended BCSC Opal Retail Award for ‘Best New Retailer of the Year’ in 2014. 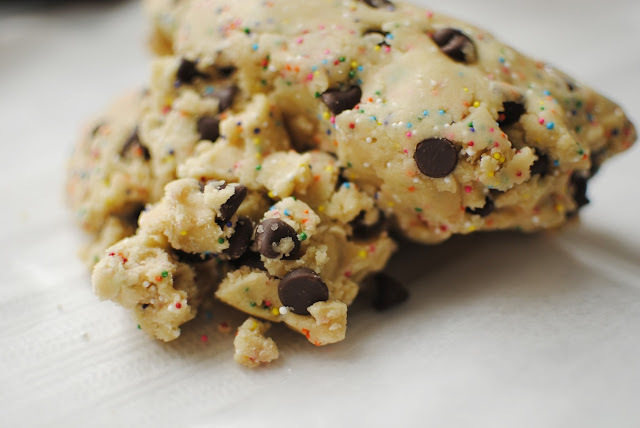 The craze is also popular in the US, with company Cookie Dough Café stocking products in an impressive stretch of US stores and supermarkets, as well as offering the option to shop online. As previously mentioned, the cookie-dough is 100% safe to eat. Why? Simply because the raw eggs you’d add to your mixture at home are taken away. So any worry of salmonella poisoning your parents would warn you about, as you sneakily licked the spoon when baking at home, is banished. A good thing too, with Salmonella causing the most hospital admissions due to food poisoning; 2,500 per year, as reported by the Food Standards Agency. However if you’re all about home-baking, buying pasteurized eggs to add to your cookie dough mix will reduce the risk of salmonella significantly, as opposed to non-pasteurized eggs. So, if you’re one of the raw cookie-dough lovers, the option for deliciously-flavoured, safe-to-eat cookie dough is here to stay, with My Cookie Dough set to open more outlets in the UK soon.